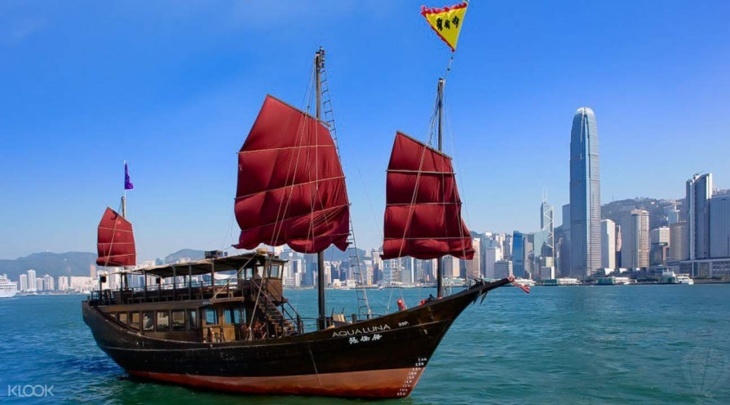 Experience the very best of Hong Kong's stunning harbor and surrounding neighborhoods – Central, Wan Chai, Hung Hom and Tsim Sha Tsui – aboard one of the city's last remaining traditional Chinese junk boats! The cruise's hourly circuit means you can hop on and hop off wherever, whenever you please, while the minimal commuter traffic on the water lets you explore Hong Kong's popular sights a more easygoing way! Be sure to stop off at Central, the heartbeat of Hong Kong Island and the link to the historic Peak Tram and the world-famous Victoria Peak! Hung Hom, a vibrant shopping, entertainment and dining hotspot, is a great place to see Hong Kongers at home. And where else will you find a cruise ship-shaped shopping center in the middle of the district? Enjoy some of the other AquaLuna activities: AquaLuna Harbor Night Tour, AquaLuna Stanley Cruise, AquaLuna Dim Sum Cruise and AquaLuna Symphony of Lights Cruise!